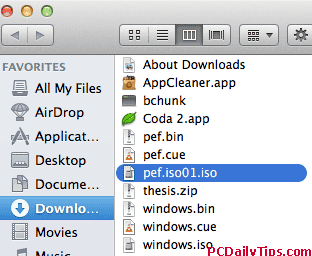 Converting .bin .cue files to .iso in Mac Mavericks OS X (another Mavericks tips about text edit you can find here). If you use Windows environment, there are a lot of possibilities on doing this. But if you use Mac OS X, there aren’t many options as in PC. Easily, you can convert .bin and .cue files to .iso file using Toast Titanium, which is sold commercially, although you can have it as a trial version. Another alternative, we can do it for free. Depending on how your .bin and .cue files were built (sometimes one of them is corrupted), you can do following options. Duplicate the original .bin file, and rename the duplicated to an .iso file. Say, you have a file.bin and file.cue, rename the file.bin to file-copy.bin. Most of cases, the new .iso file will mount. Using bchunk, you can download directly from the developer site here. 1. After download, extract it with archive utility, usually in your “Downloads” folder, double click the chunk.zip file. This is how it looks like on your terminal. Hit return, and it is mostly asking your login password. Type it, and return. 3. Next line, drag your bchunk file, drag your bin file, drag your cue file, drag bin file again, and rename the last bin file to iso. It will convert your file. Still in terminal, type “Exit”, press CMD+Q to quit Terminal. 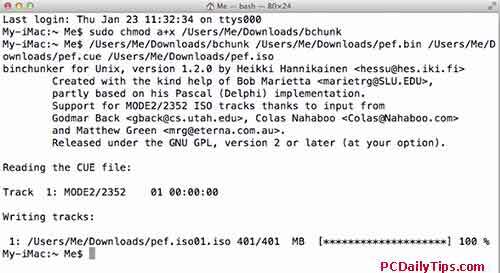 You will probably have an .iso file, probably an .iso01.iso depending the files you are converting. I renamed my .iso01.iso to .iso and it will be mounted nicely. If you have “iso01.ugh”, I suggest you just to rename the duplicated .bin file like in Option no 1. 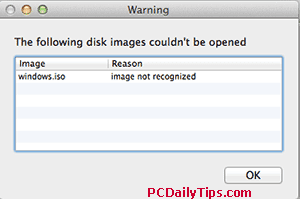 This is because when you rename the iso01.ugh to an .iso file, you will get “The following disk images couldn’t be opened, image not recognized warning dialog box, as shown above. So what is your experience with it? Probably after converting your bin and cue you will get another different file extension than I already mentioned above.